Which way to the doughnuts? 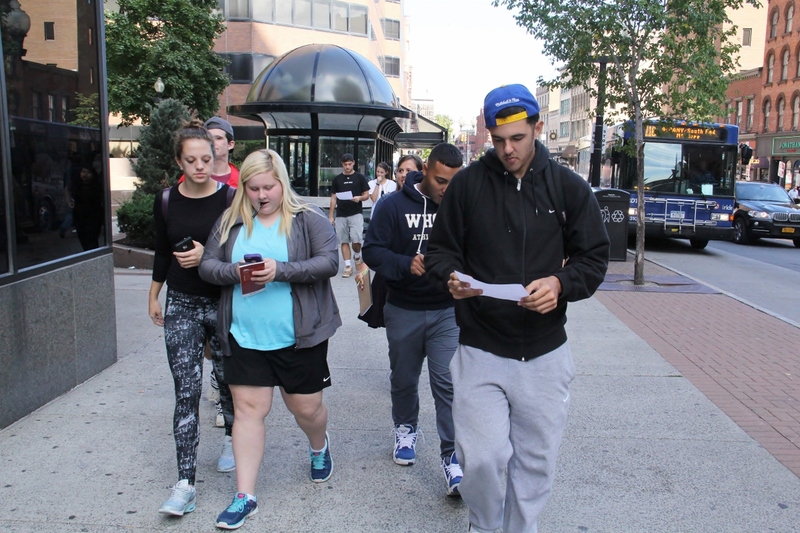 These are two of the 10 clues Saint Rose students in the Fundamentals of Business class followed during a recent excursion intended to show them the offices, shops, government buildings, monuments, historic sites and cultural institutions in downtown Albany. 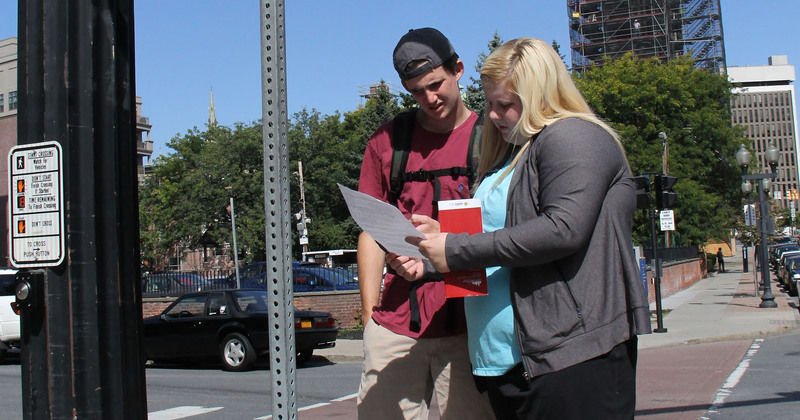 Piling out of College busses in 45-minute shifts, the 100-plus first-year students used the clues to prepare them for their final project: developing business proposals to further energize the streets that lead from the state Capitol to Broadway. To help, the experts in this terrain, the Downtown BID (Business Improvement District) devised the clues. At first some of the students professed to be, er, clueless, until they began to hunt around for answers. Nick Clemente, for instance, spotted a Hilton Hotel concierge and, in a moment straight out of TV’s “The Amazing Race,” saw an opportunity. “Do you know of a bridal shop that was on ‘Say Yes to the Dress?’” he asked. The answer found him rushing up State Street. Maria Pidgeon, among the professors who teaches the required class, worked with the BID on the quick-hit learning experience. Before coming to Saint Rose, she served as a senior economic developer for the city and helped usher in some of the stores and businesses her students competed to find. “Learning outside the classroom students get to experience working as a team,” Pidgeon noted. “They also get to become inspired by their surroundings. *Answer: Cider Belly Doughnuts, 29 North Pearl Street. ** Answer: Angela’s Bridal, 126 State Street.